Fewer than 1 percent of Leopard Groupers will transform into this golden color. Once a typical brown spotted leopard grouper is around ten inches in size, in this minute number of fish a genetic marker in the DNA will be triggered, turning the fish this golden color. 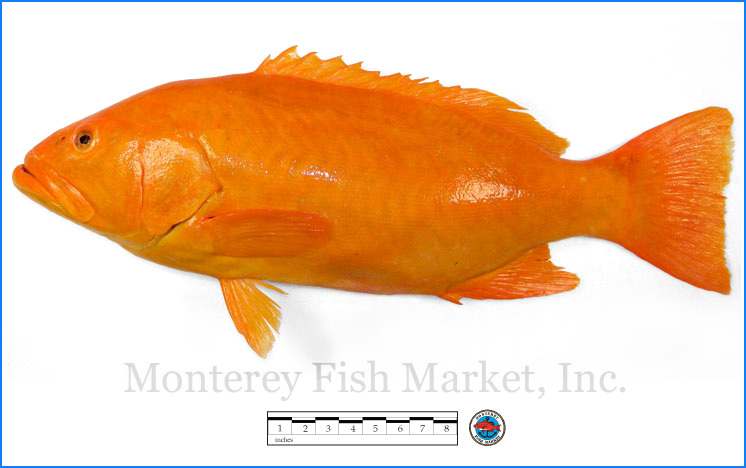 Nothing but the color in this fish changes; this and its brown sibling are genetically and taxonomically identical. Pretty amazing, and coincidentally, this is the first one we've seen at Monterey Fish. Since groupers reproduce slowly, many are vulnerable to over-fishing. New restrictions are helping rebuild the stocks in the United States and Mexico. Sweet and mildly rich with a toothsome, firm, dense moist texture.